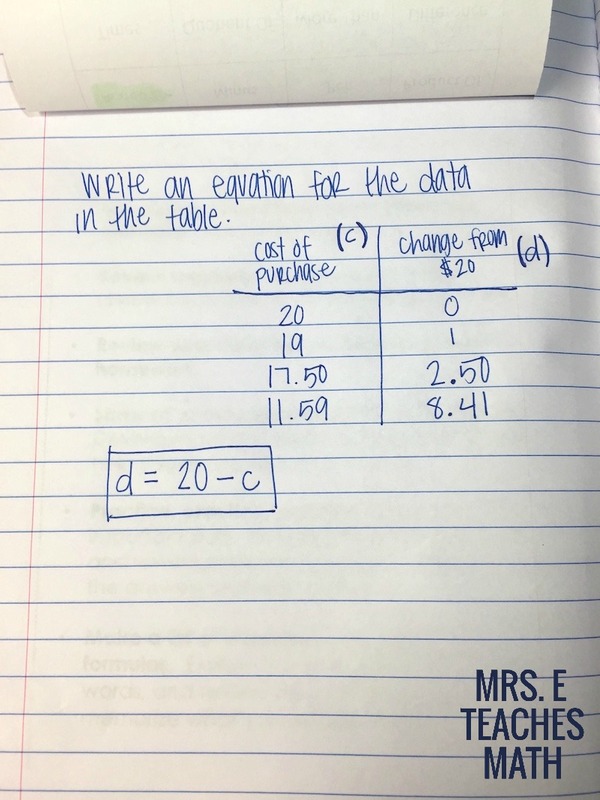 My Algebra 1 kids are really taking to interactive notebooks. They’re doing great and are so quick at getting pages glued in. I have a great group in Algebra 1 this year. 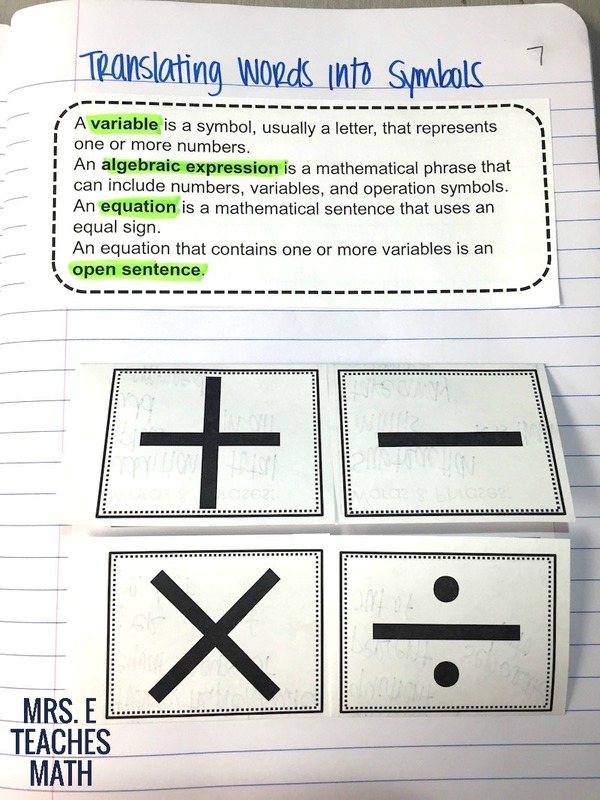 I’m going to share my Algebra 1 notebook pages in the same format that I shared my Geometry pages. I’m going to sort of outline the way I taught the unit. My students didn’t add to their notebooks everyday, but they did most days. The first page we created had vocabulary at the top. We highlighted the words as we talked about them. 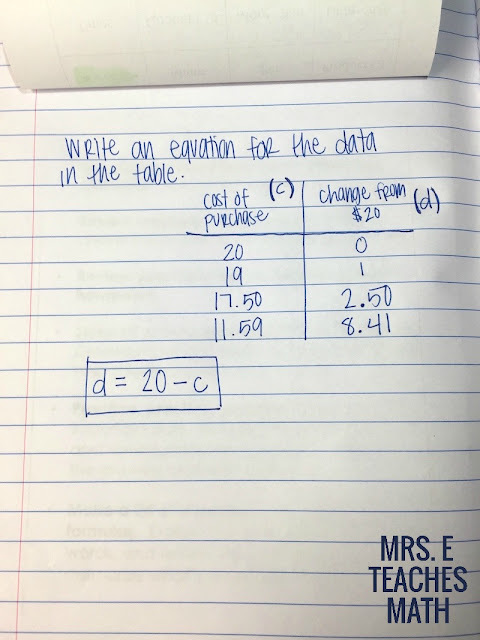 It annoys me when students try to “solve” expressions, so I harped on the difference between expressions and equations a little bit. Then, we completed this foldable by Lisa Davenport. I had kids call out examples and I gave some as well. After that, I had my students complete this coloring sheet from Math=Love. A couple of the phrases were tricky for my kids, so I gave periodic hints to the class as I walked around. I didn’t have them glue the sheet down all the way. They only glued the top, so that it is like a giant tab. Under the sheet, I had them write out a table and we practiced writing an equation from the table. This was hard some some kids. This was the first Friday of school, so I had my students practice from the first lesson. We went over homework, students completed a joke worksheet, and then finished their weekend “homework” assignment in class. I’ll post more later with the rest of the unit! 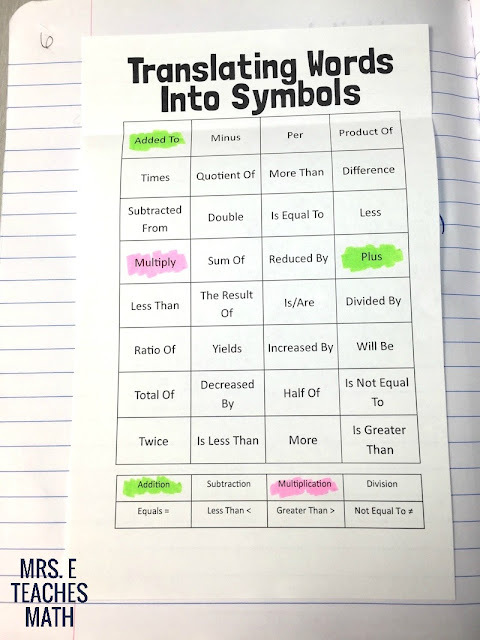 I did a great review activity with my algebra 1 class last year from Sarah Carter @mathequalslove. It was an I have - Who Has whole class game. Here's a link to all her I Have - Who Has games. http://mathequalslove.blogspot.com/2015/05/i-havewho-has-complilation.html. My class loved it!